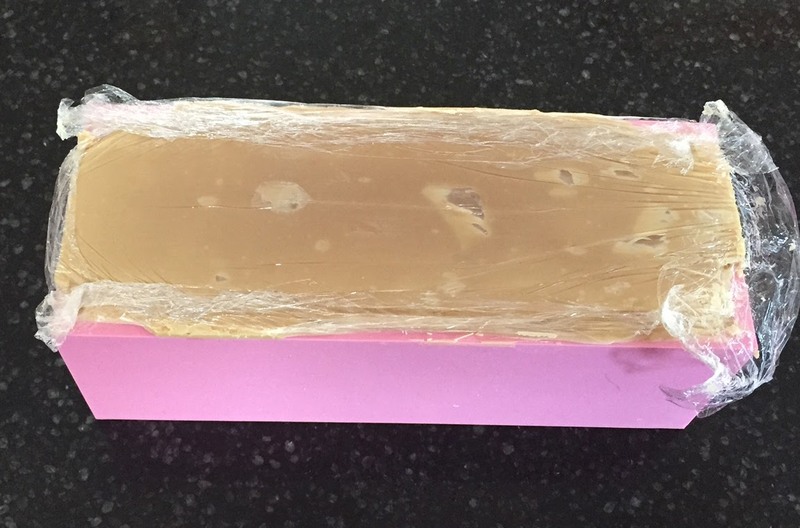 There are so many unique techniques and tools for creating interesting and beautiful bars of handcrafted cold process soap. One of my favorites is to use embeds to create a more structured look that combines the free flowing design element of swirling your colors against a solid color to really make that embed pop. Embeds can be incorporated into your soap in a variety of ways. 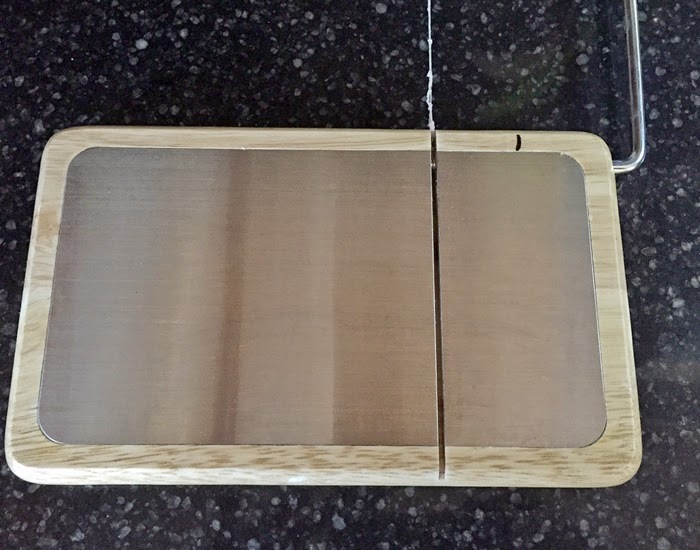 They can be added to the surface design in either a log mold or individual bar molds, embedded individually or as a long piece into a log mold so that the design shows through as you slice the log and embedded individually in individual single bar molds. 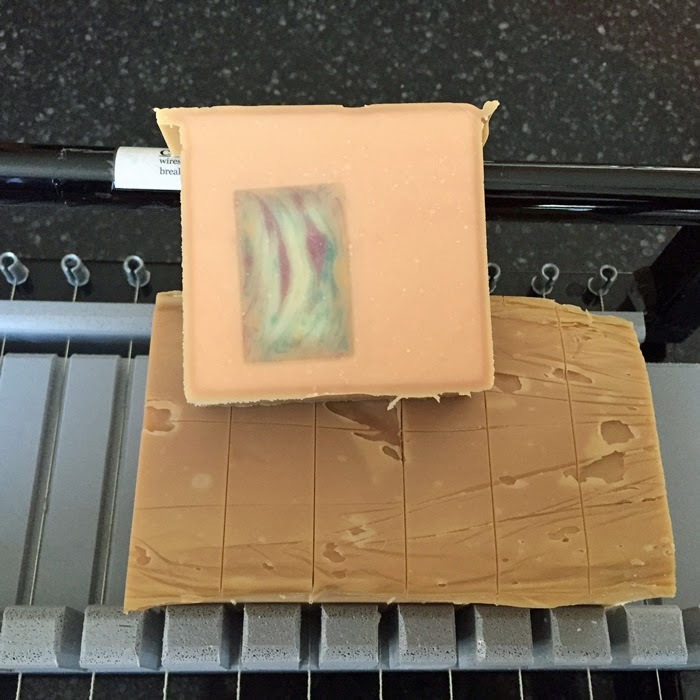 This tutorial will show how I embed soap into individual silicone molds and log molds. One reason I like to do these individually is to carefully control the placement of the embedded element. 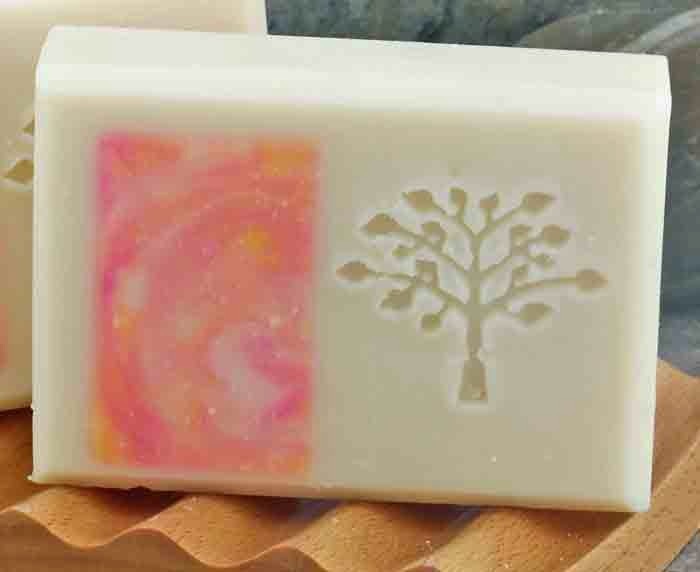 For these bars, I want the embed to only be on one side of the bar because I am going to use a soap stamp to add a design to the other side of the bar. The one drawback to this method is there is more labor involved and more cleaning up of the individually bars - so be prepared for a bit of waste that will come with trimming these bars. - This is a two day process. Day 1 to make the embed pieces and Day 2 to make the base soap. If you wait a long time in between, your embeds will have partially or fully cured and adding them to new soap can cause them to protrude a bit as the new soap cures and shrinks around the embeds. - I use the exact same formulation for both the embeds and the main soap. - You can scent the embeds or keep them unscented. If you choose not to scent them and you have extra that you want for a different project, you are not limited by an existing fragrance. 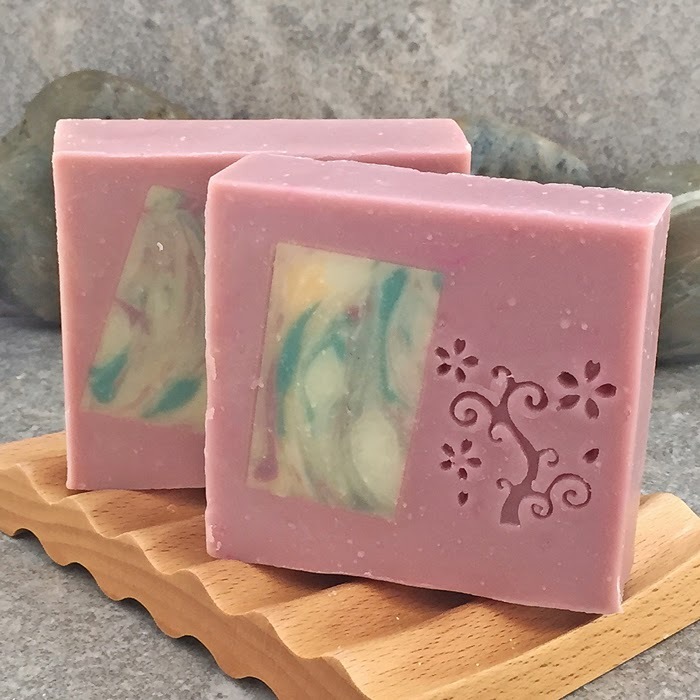 This combines several soapmaking techniques and therefore it is assumed that those trying this are experienced in soapmaking to start with and already have preferred formulations. 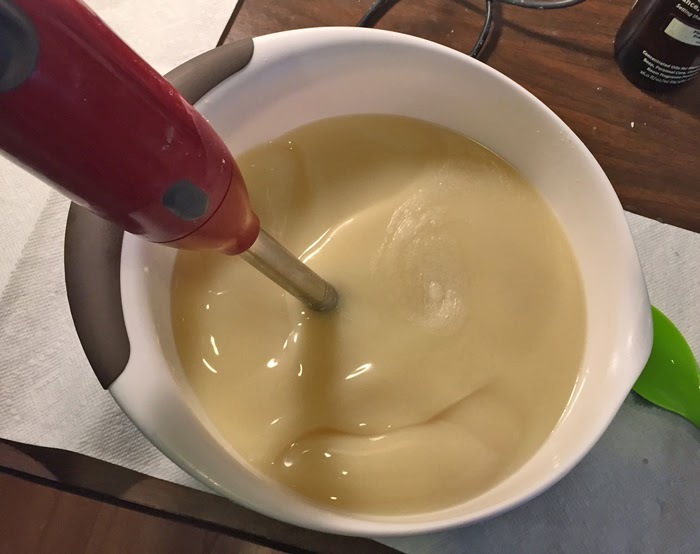 I use a slow moving formula (25% coconut oil, 15% palm oil, 50% olive oil, 5% castor oil, 5% avocado oil) and soap at room temperature to keep my soap batter as fluid as possible. I also do not use fragrances that are known to accelerate trace. Please wear appropriate safety gear when using lye as it is caustic and can cause severe burns if it comes into contact with skin or eyes. Safety glasses, latex gloves, long sleeve shirts and pants, close toed shoes. Step 2: Trim these logs to fit the individual molds. 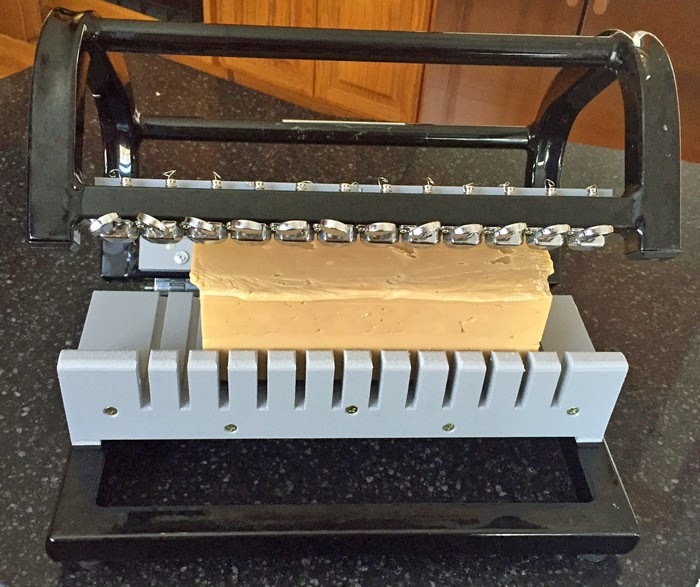 I am using this wire cheese slicer as it does the job fairly easily. Since the soap is still on the soft side, I am very careful not to create any indents in each individual embed. Each one is sliced to size, then cleaned up to be as uniform as possible. If using a log mold and not individual molds, just trim to fit and for the size of the mold. Step 3: Place each individual embed into the individual molds. 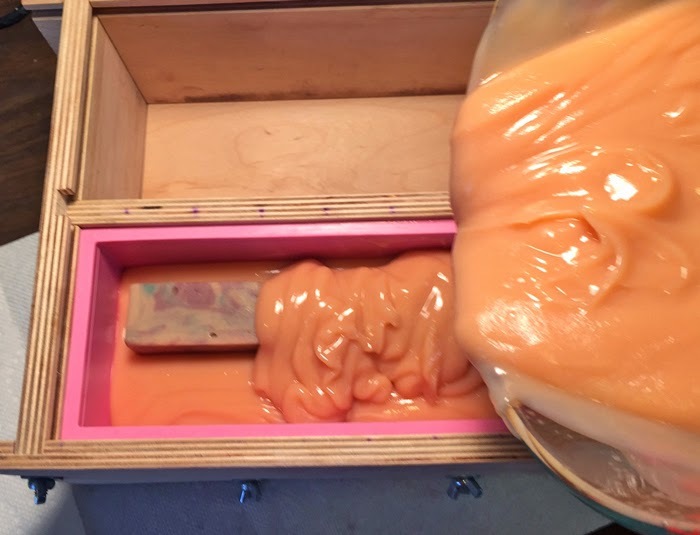 Since this soap is still fresh and a bit sticky, I use that to my advantage as it helps hold the embed soap in place in the silicone molds. I placed these to one side as I want to use one of my soap stamps to decorate the other side opposite of the embed. These 3 logs gave me 18 embeds to use, so I will create 18 individual bars of soap (showing 12 below). I place my molds on a hard transportable surface so they are easy to move around. 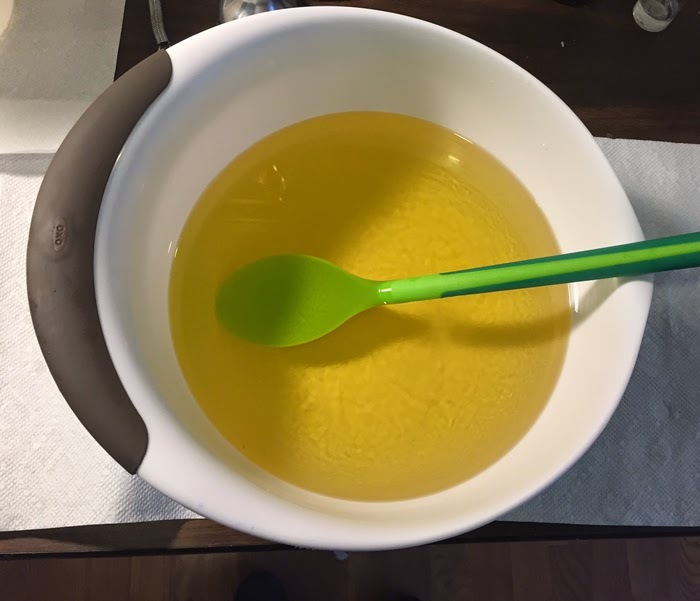 Step 4: Create your base soap. 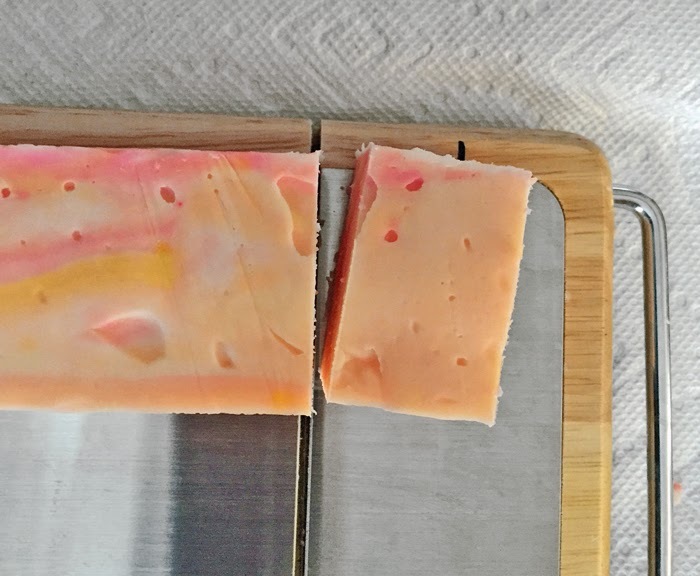 I am scenting this soap with a combination of Mango (Fresh Mango from Brambleberry) and Pink Grapefruit (Wholesale Supplies Plus). Both are beautiful fragrances to work with. I am not coloring the base soap as I want it ivory/white. I use the same formula as was used for the embed logs. Each individual mold measures 2.5" x 3.5 " x 1.25" so I need 4.3 ounces oils (2.5x3.5x1.25x.4 = length x width x height x .4 to determine how much oil is needed to fill a mold) for each cavity. Since I have 18 of them, this says I need 77 ounces oils for 18 cavities - but, I have the embeds to account for too. Each finished embed is about 1.7 ounces so I will adjust my recipe down to account for the embeds and use 65 ounces oils (1.7 x 18 x .4 = 12.24 ounces oils already accounted for. 77 - 12 = 65 ounces of oils needed. It may be a good idea to bump it up a bit to be sure to account for any waste. Add your NaOH to your distilled water. I am also using coconut milk as part of my initial liquid (51% distilled water/49% coconut milk) which I add to the melted oils so that the lye does not start saponifying the fats in my coconut milk right away when added to the lye solution. Please note that this is just a preference and many people add their milks to their lye solution. I also add sodium lactate at a rate of 5 grams per pound of base oils to my cooled lye water. The sodium lactate helps harden the bars and makes them easier to unmold. Step 5: You want to pour this soap into your individual molds while it is very fluid (light trace) so that it flows nicely around your embeds. 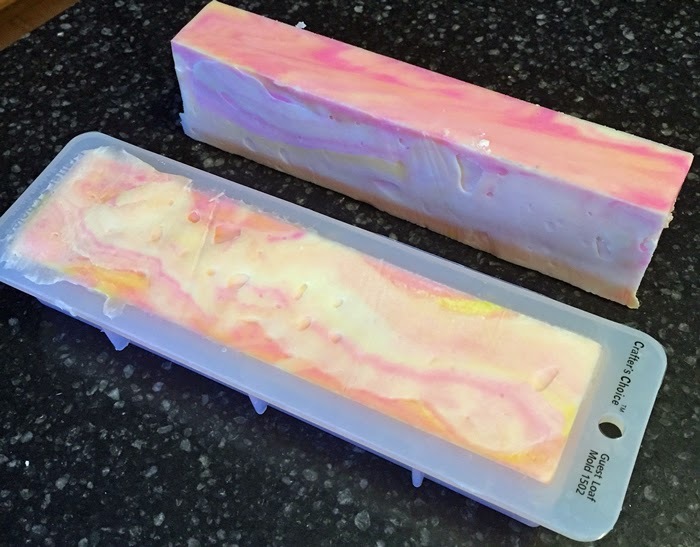 If your soap is too thick, it will be difficult to evenly fill the molds. 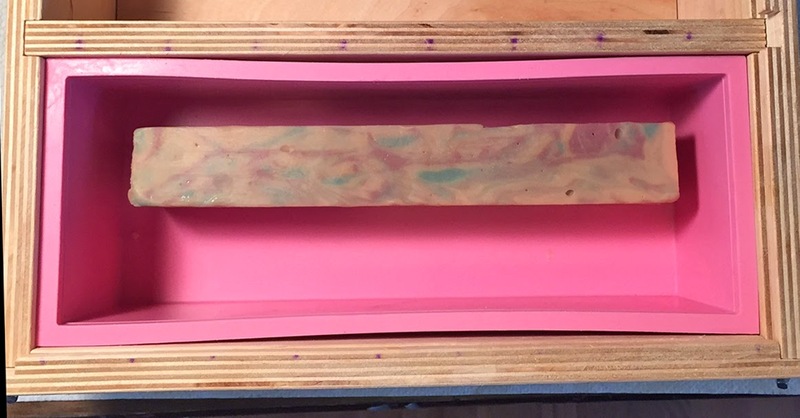 Step 6: Anytime you pour soap you have the possibility of having trapped air bubbles banging your mold on a hard surface helps bring those air bubbles to the surface. That is not easy to do with individual molds due the the flexible nature of the mold. So while I cannot do that to deal with potential air bubbles, I do cover the molds with 2 layers of plastic wrap then lightly press down on the poured batter to make sure that all areas of the molds especially those surrounding the embed are filled with soap. 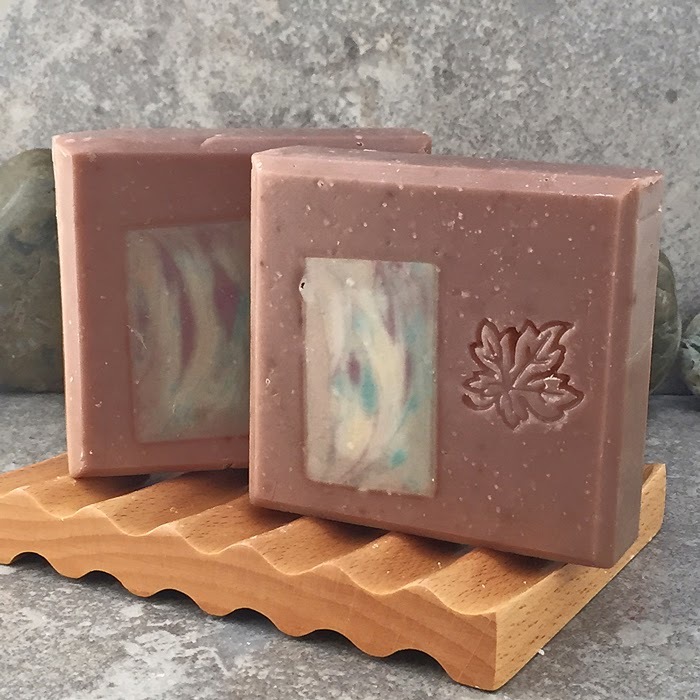 Very similar to above but you want your soap to be thicker so that the embed log does not sink to the bottom and the surrounding soap can hold its position. Place the log in the mold to determine where you will want it positioned. 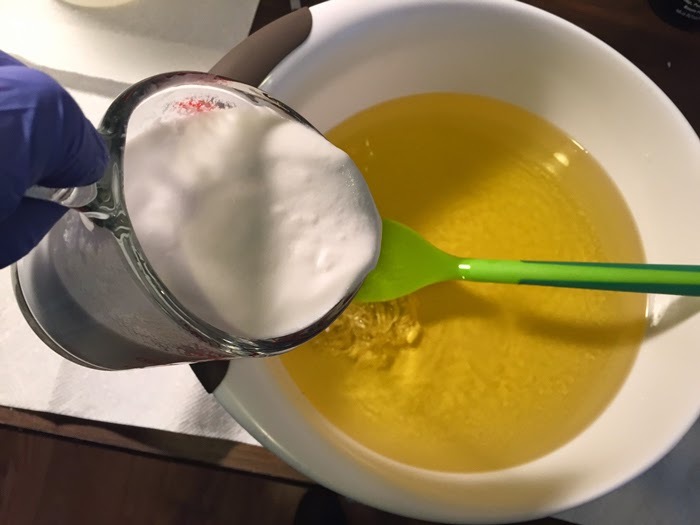 After mixing up your soap as above, pour about halfway at thick trace. 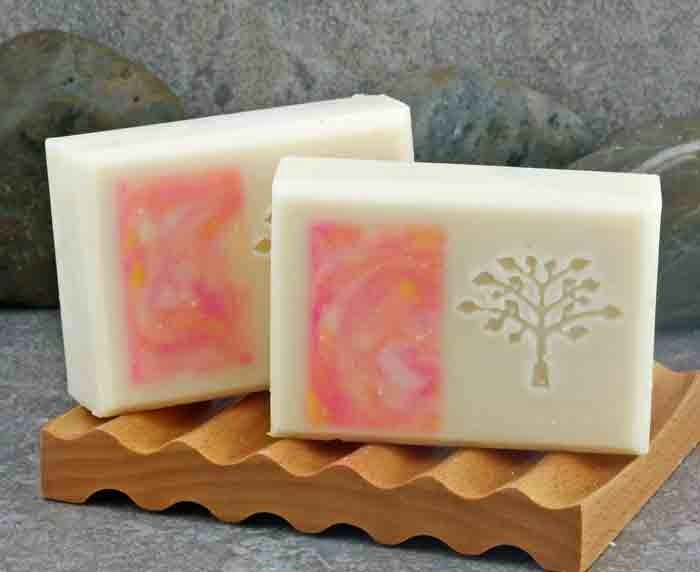 Carefully place the embed log into the thick soap pressing down only as far as you want the embed to be. 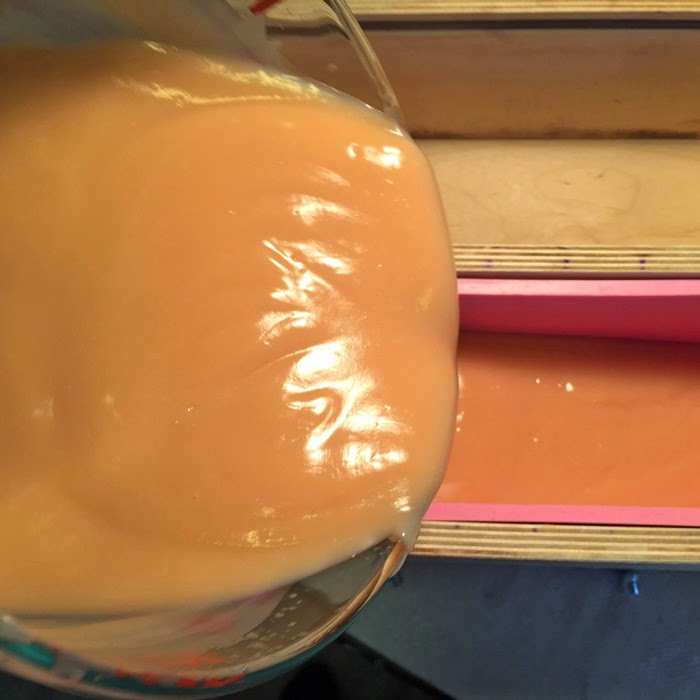 Carefully pour the rest of your soap to fill the mold. You want to try to keep your embed from moving around too much. 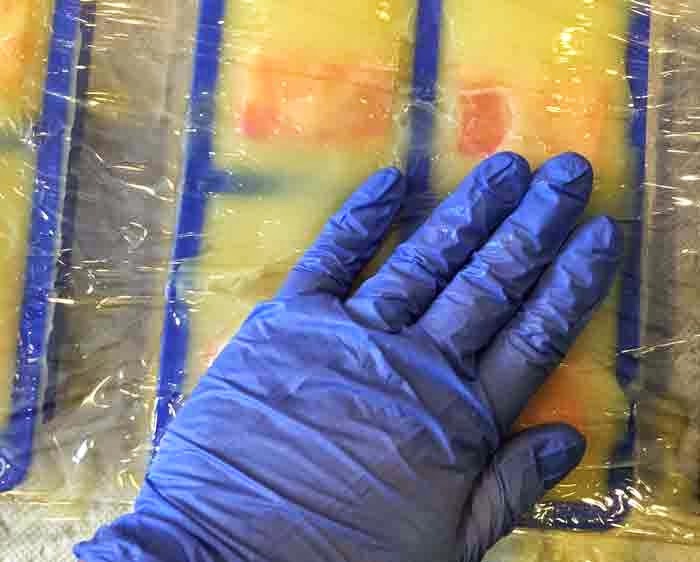 Cover with plastic wrap and carefully press down to ensure the soap has moved into all areas of the mold. You can also tap the mold on a hard surface, but any movement can alter the position of the embed. Allow to set up for at least 24 hours. Step 7: I gel all my soaps so I wrap these in towels and allow the soap to set for at least 24 hours (this will be dependent on your formulation too.) Those that prefer an ungelled soap can finish this in any manner they choose. This particular batch took about 48 hours to set enough to unmold in the individual molds but only 24 hours in the log mold. Step 8: Unmold, trim and finish the bars however you desire. I cleaned them up, added a stamped impression and beveled the edges for a finished look. Using the individual molds takes more time and a bit more wasted soap due to trimming them. Just another option to get this type of look. You did a wonderful job with the embeds, these are so lovely =) Your tutorial is great!